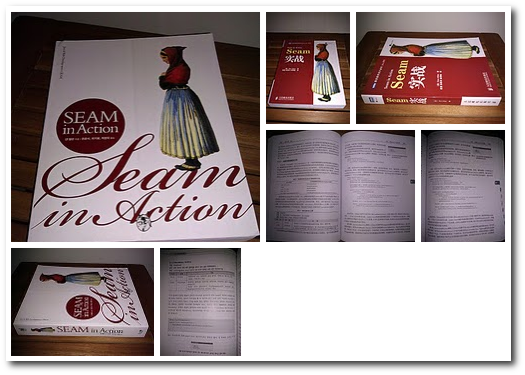 A long overdue post, I'm still excited to share that Seam in Action was translated (in 2010) into Korean and Simplified Chinese--two languages I can't even pretend to understand. It's pretty strange to see words that you spend countless hours revising look complete foreign to you. But exciting at the same time! These books arrived in a box that clearly looked like it came out of a shipping container that was aboard an ocean carrier. My goal is that sometime soon (2012 perhaps?) I'll get to travel to where these texts originated :) (but hopefully on an airplane). I have a whole stack of these books, so if you are in the DC area (or the US for that matter) and you want one of these books, just let me know. I'll mail it to you, free of charge. This post is syndicated from my JBoss Community blog. Information about the proposed Unified EL update slated for Java EE 6 is hard to come by, so I decided to put together a blog entry with some useful links. If you haven't heard yet, which is understandable given the lack of publicized information, the Unified EL is getting an update for Java EE 6. The update consists of functionality we have all wanted for a long time. Most notably, literal method names in value expressions for more flexible data retrieval and method arguments for both value and method expressions. To see examples of these feature enhancements, take a look at this blog entry by Kim-Man Chung. (If you are using Seam or Spring Web Flow, you are already enjoying these enhancements courtesy of the JBoss EL). Let's start by looking at the big picture. The Unified EL is defined in Part II of the JSR 245: JavaServer Pages 2.1 specification, lead by Kim-Man Chung. The maintainence release 2 of JSR 245 is the one on the ballot for Java EE 6. I'll pause in anticipation of your pressing question. No, there is no dedicated specification for the Unified EL. (I'm lobbying for one, though). The Unified EL evolved out of JSP (where it was just the EL) and was later adopted by JSF. It's just as much a part of JSF as it is a part of JSP, which is why the situation is so awkward right now. To find the proposed changes for the Unified EL, you have to look at the JSR 245 MR2 Change Log. Specifically, focus your attention on the Expression Language page. Believe it not, that's as official as it gets. Trust me, the absence of process disturbs me too. Great, so what about the implementation? Can you try this stuff out? I had some difficulty finding that information too, but alas, I have more links for you. The reference implementation of the Unified EL is hosted at java.net. The project is named uel, short for Unified EL. There are several tags corresponding to beta releases in the Subversion repository and the artifacts (JARs) for most of the beta releases have been published to the java.net Maven repository (EL api, EL impl). However, I can't find any announcements about these releases. The version of the Unified EL you are looking for is 2.1.2. "How did the version jump from 1.1 to 2.1.2?" you may ask. I happen to know the answer to this question because I was in the EG meeting at JavaOne in which Kim-Man Chung gave a status update of the JSR 245 MR2 spec. He said that the version was bumped to align it with the JSP version, which will also be 2.1.2. Given that the Unified EL should be it's own spec, this makes absolutely no sense, but at least you know the reasoning behind it (and don't think you missed a haf-dozen versions in between). I'm also not happy at all about the closed-door decision, but I digress. At some point, the Unified EL update will show up in GlassFish V3. As far as I can tell, it is not bundled today (but could be by the time you read this). How can you tell if it's there or not? The EL API can be found in the glassfish/modules/javax.servlet.jsp.jar file and the implementation is glassfish/modules/web/jsf-impl.jar. Extract the JARs and look at the META-INF/MANIFEST.MF or the pom.xml file to determine which version it is. You could also look for the presence of the javax.el.ValueReference, which is a new class in the API. In case you were wondering, JBoss EL 2.0 is not (yet) and implementation of the Unified EL 2.1.2 API. Stay tuned. So there you have it, information about the Unified EL update. I'm sorry this information is so hard to piece together. I think this would all be a lot simpler if EL was its own spec and/or there was decent information published about JSP. Oh, if the spec were actually open. The thing is, I don't give a care about JSP and frankly I want to divorce that spec in every way. UPDATE: I put together a formal list of proposed enhancements requested by the Seam community on seamframework.org . UPDATE: Ryan Lubke also blogged about the Unified EL update for Java EE 6. He included tips on how to update GlassFish with the latest EL build. UPDATE: The EL spec document has been updated, making the changelog I cited above official. Grab the EL spec document from the "for evaluation" link on the JSR-245 maintenance release download page. What a year! There's no question that year 30 was the most eventful and life changing year of my life to this point. I truly feel like I have grabbed life by the horns and got it steered in the direction I really want it to head. By far, the biggest accomplishment of the year was getting Seam in Action published. But writing my first book was the catalyst for many of the other events that took place. From start to finish of year 30, I presented for the first time at a software conference, which led to a half a dozen speaking engagements, more travel than I've ever done in one year, including my first ever trip to Europe, and the chance to meet a lot of prominent industry leaders. Writing the book also helped me be more prolific. I passed my 100th blog entry and posted 1000 tweets on Twitter, which I began using just before JavaOne. The gutsiest and most permanent decision I made all year was deciding to get LASIK, and in the words of Tiger Woods, "the results were fantastic". What follows is an account of this passage into my 30 somethings, most of which can be found in my tweet archive. I'll be speaking at two conferences back-to-back in March, which is about as much madness as I can handle. First I'll be traveling to Vegas to speak at TheServerSide Symposium at Caesar's Palace on my birthday (March 20th). It's interesting to note that just over 6 months ago I was near Caesar's real palace, or what's left of it. Then I'll be coming back home and speaking at Emerging Technologies for the Enterprise in nearby Philadelphia the following Friday. In both cities, I'll be speaking about Seam Security. Always wanting to put on a good show (I mean, it is Vegas after all) I put together a fresh application that leverages Seam's new identity and permissions management API. It's a design comp manager that allows a designer to share designs with clients. The application showcases how Seam Security blends ACLs and rules in a truly unique and revolutionary way to provide a powerful and expressive security model. While creating an application like that may sound difficult to achieve, my talk demonstrates that it's shockingly simple setup and start using. Like poker, though, it does take time to perfect. Authoring complex rules are not always easy. I spent nearly two days getting a feel for the API. But then again, I've got a killer app to show for my labor. The full abstract of the talk is below. Security is the cornerstone of your application's integrity and, consequently, you need to weave it throughout each layer, often in diverse ways. Seam Security allows you to evolve the security model of your application over time, keeping pace with the development cycle. You can start with a very simple configuration that applies an exclusive security blanket over the application to keep out guests and establish a basic identity for the user. You can then mature the security infrastructure gradually by adopting Seam's declarative approach to authentication or defining fine-grained authorization rules that enforce contextual restrictions at the level of database records, database fields, object fields and UI fragments. Seam's security module, a central aspect of the Seam framework, offers a significantly simpler alternative to JAAS - the monolithic and cumbersome security model in Java EE. The talk begins with some definitions to sort out what we mean when we say "security". The talk then switches to a tutorial style, showing you first how to get your foot in the door by setting up a JSF form-based authentication routine in Seam using either a custom authentication method or a declarative approach where the authentication is handled by the framework. You are then presented with the numerous authorization styles that Seam supports ranging from binary, role-based, rule-based (Drools), and ACLs. Examples are presented to help you differentiate the four styles of authorization and when it is appropriate to use each one. In the process, you learn to appreciate that Seam's authorization is able to take the context (the target) of the restriction into account, a feature than many security frameworks overlook. Finally, the talk zooms out to show how to bring authentication under one roof using Seam's Open ID module. See you at the tables...er, I mean conferences!